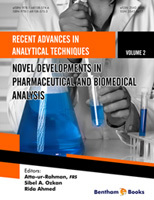 “Recent Advances in Analytical Techniques Vol. 2, “Novel Developments in Pharmaceutical and Biomedical Analysis” presents important recent developments in various analytical methods covering such fields as electrochemistry, optical sensor arrays for pharmaceutical and biomedical analysis, FTIR, high performance liquid chromatographic analysis, chiral separation and other techniques. The first three chapters cover separation techniques including chromatographic assay of solid dosage forms of drugs, UHPLC method for the estimation of drug active compounds; and HILIC based LC/MS for metabolite analysis. The next chapter presents in vitro methods for the evaluation of oxidative stress; while chapter 5 describes the applications of vibrational spectroscopy in studies of structural polymorphism of drugs. Electrochemical biosensors based on conductive polymers and their applications in biomedical analysis are presented in chapter 6 while chapter 7 discusses new trends in electrochemical sensors modified with carbon nanotubes and graphene for pharmaceutical analysis. Chapter 8 describes the use of electrochemical nanobiosensors in pharmaceutical analysis while the next chapter discusses optical sensor arrays for pharmaceutical and biomedical analyses. The applications of ionic liquids in chemical science are discussed in chapter 10 whereas new trends in enantioanalysis of pharmaceutical compounds using electrochemical sensorsare presented in the last chapter. We are deeply grateful to all the authors for their excellent contributions which should be of wide interest to the readers. We are also grateful to Mr. Mahmood Alam (Director Publications) and his excellent team comprising Mr. Shehzad Naqvi (Senior Manager Publications) and Mr. Omer Shafi (Assistant Manager Publications) for their untiring efforts.